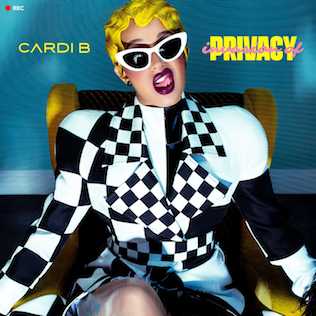 Invasion of Privacy is the upcoming debut studio album by American rapper Cardi B, set to be released on April 6, 2018, through Atlantic Records. The album title was announced along with its cover on March 26, 2018, through social media. The album is set to feature guest appearances by 21 Savage and Migos. The album has been supported by three singles, "Bodak Yellow", "Bartier Cardi" featuring 21 Savage, and "Be Careful" prior to its release. I hated this when I first heard it but now I love it for what it is, a throw away feel good bop. Cardi B's breakthrough hit also spends a seventh week at No. 1 on the Hot Rap Songs chart and a fifth frame atop Hot R&B/Hip-Hop Songs. US digital sales: #3 Bodak Yellow, @iamcardib 55,492 (371,550 total). Bodak Yellow No Small Countries! US digital sales: #4 Bodak Yellow, @iamcardib 45,477 (417,027 total). Cardi B is set to perform on 'Jimmy Kimmel Live!’ on October 18th. ARIA Singles Chart: #48(new) Bodak Yellow, @iamcardib. From one turd to another. I'm just glad she's not #1 anymore.